Kneading: that thing some cats do when they're happy where they move their front paws in and out rhythmically on a soft surface such as your lap, a blanket, or a couch cushion. Some cats extend their claws when they knead while others don't. Chances are, if you have a cat that does this, you don't call it kneading. There are many cute words and phrases that people use to describe this behavior. Here are some of the terms that we've heard here at CatHealth.com to describe kneading in cats. There are several theories among experts as to why some cats perform this kneading behavior in the first place. The most common one is that the motion is left over from when the cat was a kitten. Kittens knead while nursing on their moms, to stimulate milk flow. It's thought that adult cats may do it when they are feeling happy because it reminds them of when they felt safe and secure as nursing kittens. Another possible explanation for cat kneading is that cats outside may instinctively use their paws to pat down soft areas of grass before settling down to sleep. This could explain why you often see domestic cats kneading when they are getting ready for a snooze. A final hypothesis to explain why cats knead is that they are using the scent glands in their paws to mark their territory. This is also one reason why cats scratch objects. The answer to the feline kneading question may be one or all three of these ideas, but one thing seems to be true: cats that are kneading are feeling secure and happy. What Can You Do When Your Cat's Kneading Hurts You? Cats that extend their claws while kneading may inadvertently hurt their people. Sharp cat claws can easily penetrate clothing and find their way into human skin. There are a couple of things you can do if your cat's claws hurt you while she's kneading. You can place a thick blanket or cat mat on your lap before you invite your cat onto it. You can use Soft Paws® vinyl claw caps. These are non-toxic, easy to apply, don't hurt your cat, and are quite economical. Not only can they spare you the pain of unsolicited kitty acupuncture, but they can also help protect your belongings from cat scratching damage. Does your cat knead? 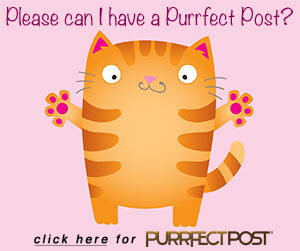 We'd love to hear about your sweet kitty and see pictures of her kneading. We'd also be interested in hearing what you call this special cat behavior. Leave us a comment!